Challenge: When working with WordPress themes and plugins we’ve noticed that some customers would like to have their own “private” versions of them. This can be a theme created for a customer that the customer paid for or a custom plugin. Obviously a customer who paid for a custom job will not want their product to be available to public for free. In a lot of cases when doing custom job one will not start from scratch but will have some framework or code to start with. Eventually, you might accumulate a number of plugins and themes that you will be providing to your customers without any or with some slight changes. It can become pretty difficult to keep all these up-to-date. Normally a WordPress repository would be used to keep everything up-to-date but since it’s not an option for the reasons described above a private repository is needed. WordPress doesn’t offer that and code repositories can be difficult and not all of them are free. We have found a simple way to have a private repository for your customers. Here’s how it will work. You will install a special plugin on your company’s main website or your development site. 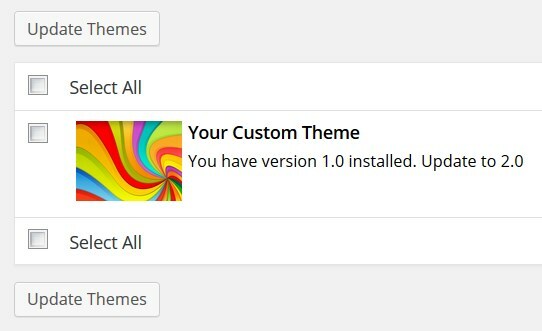 You will upload all your custom plugins and themes via the plugin’s interface. You will also need to add some short code to each of your custom plugins and themes (this should only be done once). After that all custom plugins and themes that you installed on your customers’ sites will request updates from your private repository. This way you will have all your custom work organized and always up-to-date on your customers’ sites. There will be no manual work to do on each site which in conjunction with our WordPress site management system (which we give to our partners as part of our service) will cover all the bases! Also with that you will not need to give your developers access to your customers’ sites which will create even more security. Let us know if you’d like to have such a plugin for your setup.